This week’s theme: words about poetry. It was the same Burgess who coined the word blurb. The Book Gods are smiling on me! The vada I had today was sweet. There was definitely sugar in it. I wonder why. Sweet vada is yuck. Sweet vada with upma is double yuck. This is by far the most simplest, most touching book I’ve ever had the good fortune to read. I’m not exaggerating! 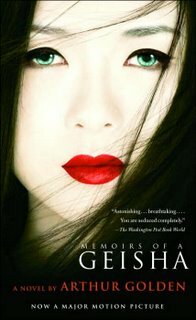 It’s the memoir of Sayuri, the daughter of a fisherman who becomes a geisha and her struggles on the way to finding her destiny. What strikes you first about the book would probably be its simplicity. The language, the narration – it doesn’t weigh you down with all the verbosity that one would generally find in a ‘memoir’. After a point, you might not even be conscious of the language or the fact that it is a book and you’re not exactly in Kyoto seeing the entire thing happening in front of your eyes. The entire story is said from the perspective of Sayuri and you can actually feel a difference in the narration when it is from a 9 year old girl from a fishing village and a 30yr old geisha – the innocence that gradually fades away as Sayuri meets the people that make and sometimes break her life. What I found spell-binding was the way of life for a geisha. I remember those calendars we used to have at home with a Japanese girl in a kimono for each month of the year (if I remember correctly, it was Mitsubishi’s calendar – way back in the 1980s) – well, that girl is a geisha. Me didn’t know that – I thought all Japanese women dressed that way! I couldn’t have been more wrong. Their way of life is so fairy-tale-like that it’s just so amazing that people used to be like that (they could still be like that for all I know!). From the make-up, the hair (did you know their hairstyles are waxed into place and they have special cradle like contraptions to rest their heads when they sleep at night so their hairstyles stay in place?! ), the kimonos (my favorites – the author gives awesome descriptions of each kimono and each one outshines the one before) and their etiquette and what not! A beautiful book, reminds me of a lazy afternoon with a cup of hot masala tea and Mom’s potato bajjis. Aaah, heaven! Maybe I can even watch the movie now and see how close my imagination is to the portrayals on screen! Finished reading Ayn Rand’s Fountainhead for the second time. I’m yet to come across a book that can stay on your mind every waking moment for at least a week after you finish reading it. I want to meet Howard Roark. Yeah, as simple as that. If possible, I want to BE Roark. The philosophy is so amazingly simple! But the simplicity ends right there. There cannot be a more tougher set of ideals (or principles in life) to follow than what Roark does. His absolute love for architecture makes you want to..I dont know, it’s just so overwhelming! That’s the word – overwhelming. I’m pretty sure I’m going to read this book again. And again. And yet another time. You’ll be forced to, it’s that addictive. You get transported into this surreal world where people can play the most dirtiest of politics, at the same time be the pinnacle of integrity. Your feelings towards the characters changes so many times in the course of the book. One time you feel disgusted thinking about the guy, 10 chapters later you fall in love with that same character. I’ll just be making a mockery out of the whole thing if I attempt to write about the book. Reading this book should be written down on the things-to-do-before-I-die list. At least thrice. There’s a reason why a book written in 1943 is still under publication (recently had a 25th anniversary edition published!). A part of you changes everytime you read the book. That’s for sure. I’ve had two already. Some people can listen to Himmesh Reshammiya at 8:30 in the morning, while having breakfast. Am I the only one who finds him as enjoyable as the sound of nails scratching on a blackboard? It was pitch black all around her. She instinctively closed her eyes and opened them again, making sure she hadn’t gone blind. She hadn’t. That was a relief. She felt disoriented even in her haven. She was surprised how her own home felt so alien when the lights were out. I have to tell Ani to get that inverter no matter how expensive, she decided. The dark still unnerved her, like it had when she was a child. She put the lid back on the box she was opening and turned around, hands outstretched, to go back to the hall and get the emergency lamp. She took two tentative steps forward, hands waving around to make sure she didn’t collide with anything in the room. She had an idea how far the door would be from where she was standing. She tried feeling out for the familiar contours of her microwave oven. Two steps to the right of that was the door. She now felt the rough wood and stopped for a moment to get a bearing on which way she has to move next. There was a faint light outside the curtained windows. Feeling emboldened, her next few steps were more confident around the dining hall. There were no obstructions on the path to the hall, she knew. They had left it like that so Chinnu could play around in her small tricycle. Her heart skipped a beat, ‘Chinnu!’. She realized a moment later that her baby was out with her father. She smiled to herself, it was one of those things about being a mother. She wondered if her own mother was this protective of her when she was a child. No, she decided, no one would be as protective as her. The showcase glass glinted in the feeble light from the window. Reminding herself to be careful not to knock over the trinkets kept in the glass shelves, she felt around for the edge of the showcase and moved further. She would hit the recliner any time now. And she did. She bent down a little and felt her way towards the table in the corner. Why the heck did I keep the emergency lamp in such an inaccessible place, she chided herself. She stepped on Chinnu’s Pooh, left on the carpet – it gave a feeble ‘peeep’, as if in protest at being walked over. Their life had changed so much after Chinnu was born. And Ani wanted another child. Her stomach turned over when she thought about that. Ani would want to talk about it tonight and she was still not ready to tell him. She was running out of excuses to not talk about it just yet. He would not understand why she did it. No one would. Lamp forgotten, she sank down on the couch. She had always wanted to be a mother. But the doctor had said Ani would not be able to give her that joy. Tears were now streaming down her face. She loved him too much to let him know the truth. And Chinnu! He wouldn’t love Chinnu the same if he knew. Or would he? He wouldn’t, said a little voice in her heart. Remember, he didn’t want to go for adoption. He wanted the child to be his own. But Chinnu wasn’t his own. How would he ever understand? She didn’t love Hari, she never did. But she always wanted to be a mother. The lights came on, momentarily blinding her. She would not tell Ani the truth, he didn’t have to know. She walked over to the table and absent-mindedly switched on the emergency lamp.